Meetings and events are a daily fact of commercial life, and this year they’re set to become even more prevalent. It would seem that in our increasingly digital age, it is now more important than ever to counterbalance screen time with face-to-face interaction in real life business. Here at Function Fixers, we always keep our fingers on the pulse of what is happening in the events industry. Knowing what’s in, what’s out and what’s coming up next is what gives us the ability to source the best venues for our clients for any type of event – large or small, formal or casual, business or pleasure. For fast, free, professional advice, contact our friendly team on 020 7186 8686 today. Let’s take a look at some exciting event trends to look out for in 2019. Caring about our planet has never been more important, and going green is increasingly finding its way into business practice, office management and event organisation too. Event planners will have to work even harder to ensure that meetings and events are run with sustainability in mind. From providing locally sourced food and drink and recycling facilities to working with plastic-free suppliers and seeking out carbon neutral event spaces, there’s a rising demand for eco responsible initiatives from event organisers and delegates alike. What do you get when you incorporate leisure elements into a business event? Bleisure trips are an innovative way to encourage greater event attendance and engagement by offering something extra and a bit different. The trick is to bundle the main event with a pre-event activity that is fun and has some exclusivity value. Whether you choose a private tour of a country estate or a celebrity chef led chocolate making workshop, a ‘bleisure’ event gives your delegates the opportunity to meet, network and bond in a non-competitive and informal setting, ahead of the business event. The success of any event is ultimately defined by delegate experience and engagement, which is why it is no surprise to see that event formats are getting bolder and more innovative. Think unique venues such as a yurt, boat or beach, seating delegates on sofas and beanbags instead of traditional conference chairs, moving the stage to the centre of the room, or introducing new technology such as virtual reality. In an effort to attract increasingly demanding delegates, the only limitation is your imagination. 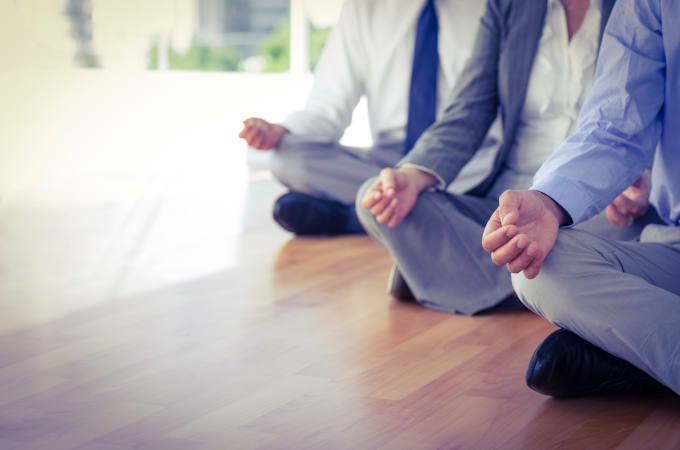 Wellness has had a big effect on business culture in the workplace over the last years. No wonder that it has now found its way into corporate meetings and events too. From mindful breathing exercises, meditation sessions, yoga or tai chi classes to help the mind and body prepare for the event ahead, to having dedicated mental health sessions available on demand, it is clear that 2019 is the year that emotional intelligence is crossing over from the office environment into the events world.